Establishing various cooperation to improve the welfare of the community is one of the duty of a university in realizing Tri Dharma of Higher Education. 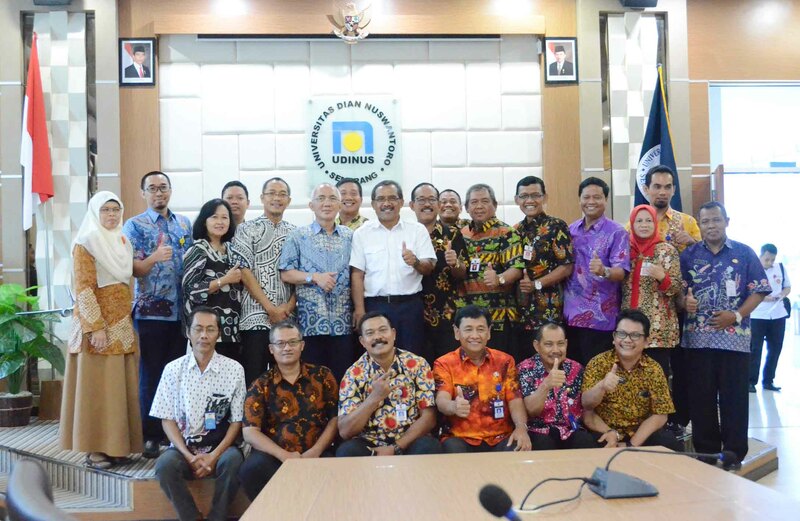 Universitas Dian Nuswantoro (UDINUS) has been working with various City and District Government, and on Friday 23rd of February 2018, UDINUS was once again asked by the Government of Blora Regency to advance Blora Mustika. On the 1st floor of H Building, UDINUS, a cooperation was signed by Blora Regent, Djoko Nugroho and UDINUS’ Rector, Prof. Dr. Ir Edi Noersasongko M. Kom. "This cooperation is one of the application of Tri Dharma of Higher Education. We can make the Problem in Blora as a research materials, community service, and also to improve the quality of education, "said Edi Noersasongko. In the event, from UDINUS’ party was attended by the Vice Rector III of Student Affairs, Dr. Kusni Ingsih, the Deans who represented each faculty, and the ranks of officials in UDINUS academic credentials. Meanwhile, from Blora Regency party was attended by Blora Regency Secretary, Drs Bondan Sukarno MM, Secretary Assistant of of Blora Regency Government, Setyo Edi SH MH, and officials of Blora Regency Government. The benefit of UDINUS’ achievements in various activities are now can be felt, especially in IT field. UDINUS successfully handled the admission of Semarang Students, the admission of AKPOL’s candidate, and also the recruitment in The Ministry of Justice and Human Rights of Republic of Indonesia. "Today is a happy day for Blora Regency, because working with UDINUS means opening a new opportunity to move forward, especially to develop Blora regency in IT field, "said Djoko Nugroho.